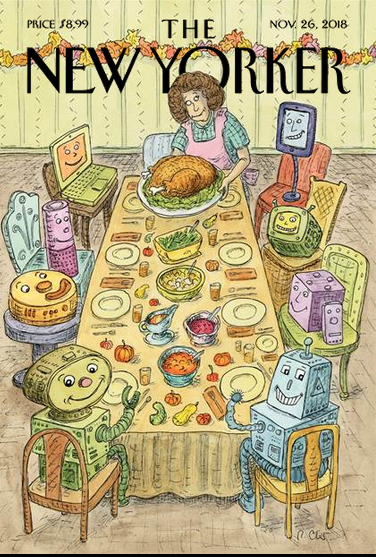 It’s not just the Technology issue this week, but also the Thanksgiving issue; Roz Chast’s cover blends the two. 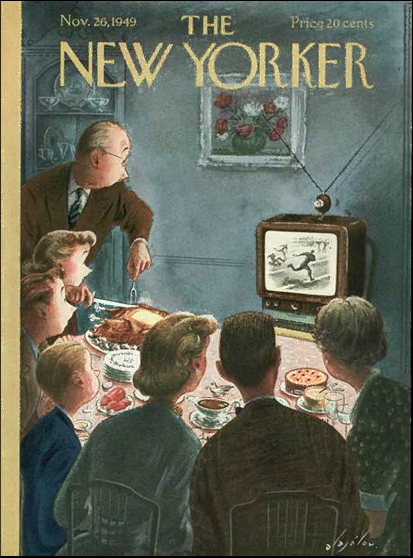 It got me thinking about New Yorker Thanksgiving covers of the past, and looking through them I found this one, by Alajalov from 1949. As with Ms. Chast’s cover, it blends the Thanksgiving table scenario with (then) relatively new household technology (the television set). What a great cover! Constantin Alajalov (above) Born Constantin Aladjalov, 1900, Rostov-on-the-Don, Russia. Died Oct., 1987, Amenia, New York. 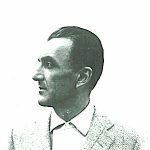 New Yorker work: 1926 -1960. Perhaps best known for his New Yorker covers ( he also supplied cover art to other publications). Key collection: Conversation Pieces (The Studio Publications Inc., 1942) w/ commentary by Janet Flanner. Link here for a n Alajalov profile from The Saturday Evening Post. 16 cartoons. 22 illustrations, including 5 1/2 full page illustrations. Robots abound in this issue (on the cover, in a cartoon, in an illustration). Among them are two Thanksgiving drawings, one by P.C. Vey (also blending technology and Thanksgiving), and David Borchart, who gives us a wonderful (Macy’s?) parade drawing. My only wish is that it was run larger. Also of note in the issue: the debut appearance of Ali Solomon. Ms. Soloman is the 10th new cartoonist introduced this year, and the 22nd new cartoonist introduced since Emma Allen became the New Yorker‘s cartoon editor in the Spring of 2017.